Rosemary and Garlic infused Olive Oil is an easy to make seasoned oil that can be used for a variety of recipes, such as salads, roasted potatoes, and marinades. I originally wanted to post a series of recipes that you could prepare for the Easter holiday gathering but time got away from me and I will only have time to post a few over the next week. To start, I am posting a recipe to make Rosemary Garlic Olive Oil. This week I will be posting the recipes for Rosemary and Garlic Focaccia, Smashed Potatoes (using red and/or sweet potatoes), and Roasted Beets with Balsamic Glaze. Both recipes will utilize the Rosemary Garlic Oil. NOTE: This oil can be made with any variety of fresh herbs, individually or in various combinations. Herbs that work well are – Thyme, Sage, and Rosemary. * If you need to wash the rosemary, be sure it is well dried before adding it to the hot oil because any water remaining on the leaves and stems will cause the oil to pop and splatter out of the pan. Remove the leaves from two of the sprigs of Rosemary, reserving the hard stems separate from the leaves. Chop the leaves and set aside. Heat olive oil in a stainless steel, heavy weight saucepan on medium to medium high heat. The oil should be hot but not smoking. 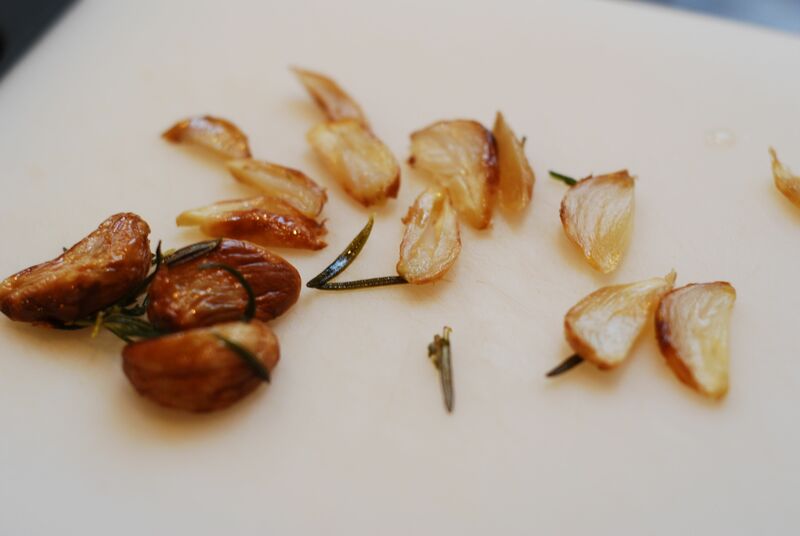 Lower the heat to medium and carefully put the garlic, rosemary stems, and the whole rosemary sprig into the hot oil. 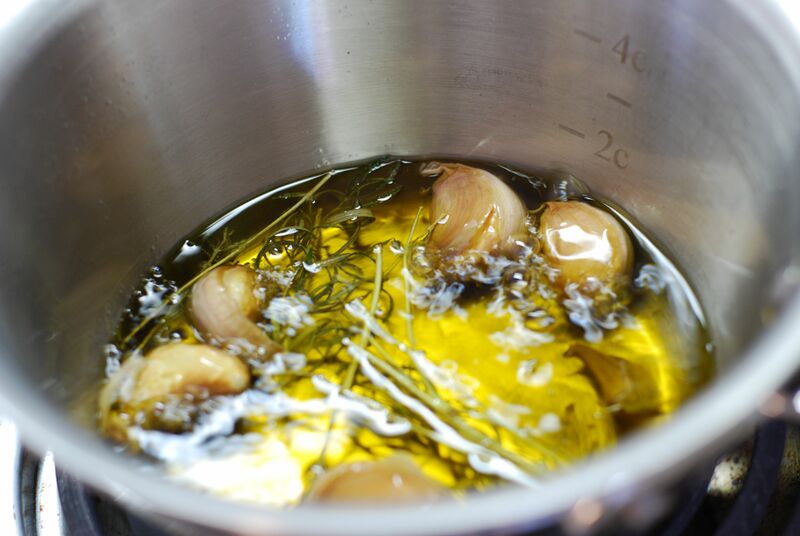 Let the garlic and rosemary sizzle in the oil until garlic begins to turn a deep golden brown, about 3-5 minutes. Remove the pan from the heat. Using a slotted spoon or tongs, remove garlic, rosemary stems and whole rosemary sprig. 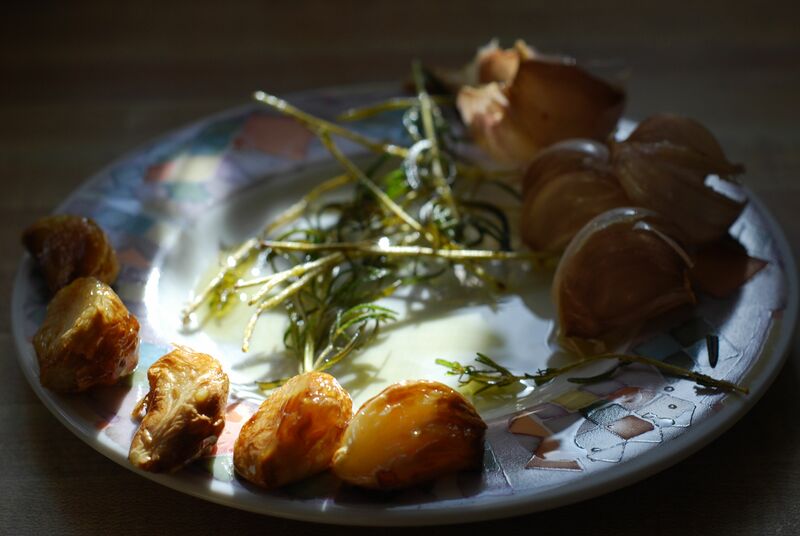 The rosemary stems can be discarded but set aside the garlic and rosemary sprig. While the oil is still hot, add chopped rosemary. The oil should still be hot enough to make the rosemary sizzle. Let the oil cool in the pan. Store oil in a glass bottle or jar to be used later. When the garlic is cool enough to handle, remove and discard the garlic skins. The roasted garlic meats can be stored in a container in the refrigerator for up to three days and used for another recipe – i.e. spread on bread, topped on Focaccia, mashed and used in a marinade or sauce, etc. The whole sprig of rosemary will be “crispy” when touched so the leaves will fall off the stem easily. They are actually very tasty nibbled on as is but they can be sprinkled on a dish as a finishing touch to add extra flavor. If you would like to keep these crispy, be sure to store them in an airtight container, away from moisture. They can be stored at room temperature for up to a week. You are currently reading Rosemary Garlic Olive Oil at Hestina's Kardia.